Martinsried, Germany  The new DSTS sensor from OZ Optics is now available from AMS Technologies throughout Europe. The DSTS sensor is a fiberoptic distributed strain and temperature sensor suitable for monitoring large structures including oil & gas pipelines, bridges, dams and power lines. Such monitoring capability is invaluable in critical structures where failure could represent loss of lives or millions of dollars. The sensor generates and measures stimulated brillouin scattering in optical fibers. 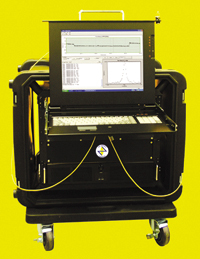 This provides high resolution measurements of both strain and temperature along the entire length of an optical fiber. The sensor measures strain with a 2µEpsilon and temperature with a 0.1°C accuracy at a length of up to 40km with spatial resolution of 10cm. By wrapping or embedding a fiber inside a structure such as an oil pipeline or dam, users can detect when and where the structure is being strained or heated. Corrective actions of the problem can be launched before failure occurs. AGAMS Technologies was founded in 1982 and today is one of the leading distributors for electronic components in Europe. The Company has its Headquarters in Martinsried near Munich. Other offices are based in Great Britain, France, Italy and Spain. The core competence for AMS Technologies is in the fields of High Power Electronics, Opto Electronics and Thermal Management.